Julián Castro is the lone Latino candidate in the crowded 2020 Democratic primary field. He’s uniquely positioned to capture the support of the Congressional Hispanic Caucus, which has more members than ever and more clout. Yet so far, he’s come up dry. 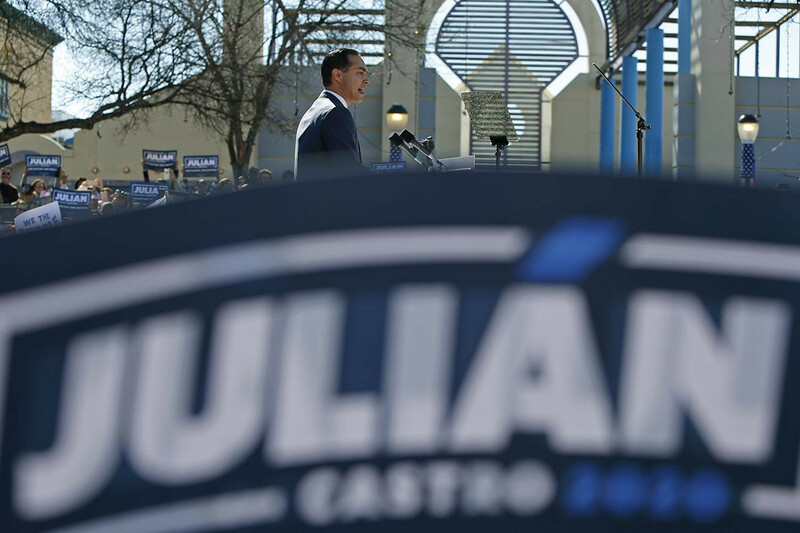 Just one of the 38-member group has publicly endorsed Castro’s bid since his campaign announcement last month — his twin brother, Rep. Joaquin Castro (D-Texas), who chairs the CHC and also serves as chairman of Julián’s campaign. It isn’t personal, according to interviews with CHC members. The reluctance so far to commit to Castro, they say, is largely due to home-state loyalties or political caution in a race that’s still taking shape. Nearly three-quarters of the CHC’s 38 members are concentrated in just four states — California, New Jersey, New York and Texas. And each of those states happens to have an announced or possible presidential contender. In California, it’s Sen. Kamala Harris. In New Jersey, it’s Sen. Cory Booker. New York has Sen. Kirsten Gillibrand. As for Texas, Castro’s home state, there is the prospect that former Rep. Beto O’Rourke might jump in the race. Rep. Nanette Barragán (D-Calif.) endorsed Harris shortly after the senator’s kickoff rally in Oakland last month. Barragán told POLITICO the two discussed issues she cares about, such as environmental justice and racial health disparities, and credited Harris for personally reaching out early. Then there’s Rep. Filemón Vela (D-Texas). The congressman is unlikely to choose between Castro and O’Rourke, according to a spokeswoman. “Congressman Vela would support both if they were to run,” said Brenda Rangel, Vela’s district press secretary. Several CHC members expressed a reluctance to choose sides at such an early stage in the campaign. Rep. Lou Correa (D-Calif.), who has not endorsed a candidate, said Harris gave him a heads up about her presidential bid but did not press for an endorsement. “I’m looking forward to sitting down and talking with her, but she didn’t lobby me,” he said. No one else has reached out to him. “I’m low on the totem pole, I guess,” he quipped. Neither Castro brother, in fact, has lobbied CHC members hard for their backing. Julián Castro expressed confidence he’ll eventually have significant support and said he understood why they wouldn’t take sides at such an early date. Those members could play an outsize role as surrogates in the states with heavy Hispanic populations where the former San Antonio mayor needs to gain traction — places like Nevada and delegate-rich Texas and California. In Nevada, support from elected officials like Sen. Catherine Cortez Masto, a CHC member and rising star who chairs the Senate Democrats’ campaign arm, could loom large. “I think she could play, if she chose to, a dramatically important role in the caucus here,” said Billy Vassiliadis, a longtime Democratic strategist based in Nevada.